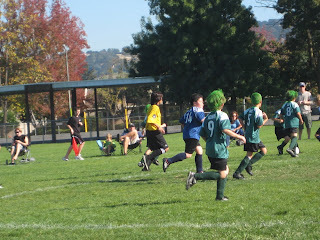 Adam playing here in number 9 - sadly they did not win despite their fearsome appearance. Finally on Saturday night we got invited to 2 halloween parties, and went trick-or-treating around the neighbourhood. 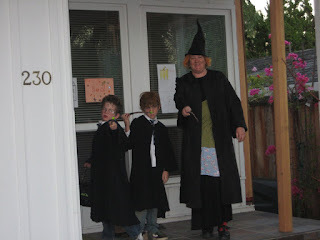 They were so pleased that I dressed up too (I'm supposed to be Mollie Weasely). Adam filled his candy bucket and was reduced to saying "Trick or Treat!, but actually I don't want any candy". As usual we transacted the candy-for-lego exchange! There is no chance that one boy could get something and not the other...so, of course, here is Adam's Ron sweater. Also from Charmed Knits this sweater is in the merlot colourway of Williamstown. 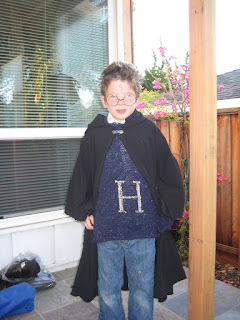 I finished the Harry Potter sweater just in time for the cub's Halloween party (these boys really know how to extend the Halloween celebrations!). I used Alison Hansel's pattern from Charmed Knits. The sweater is knitted in Webs' Williamstown yarn in the navy colour. 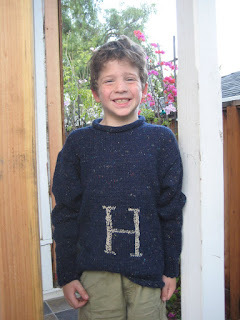 I duplicate stitched the H, although my duplicate stitch is not so good - I just consider it a more weasley sweater. Full costume reveal to come at Halloween! Coming home after a week away, I was able to see a lot of progress on the house. The new porch is framed (actually you can't see much of that behind the pistacio tree) and the new roof ridge is in place. A lot of the structural plywood is installed and the team are getting ready for roofing. This photo shows the new roof line at the back of the house. The new skylights have been framed inside, but not yet installed. The big openings in the back wall are for french windows and a large window. 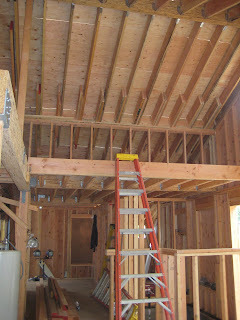 Inside, the framing for the loft is all in place. 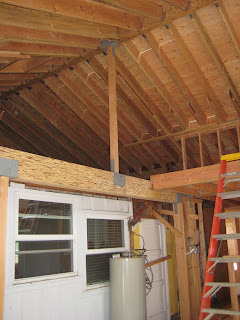 This is the gallery above the new family room, the ladder is more or less where our final ladder will go. The gallery will have railings along the edge (luckily for those of us without a head for heights). This photo was taken just inside the new french windows. 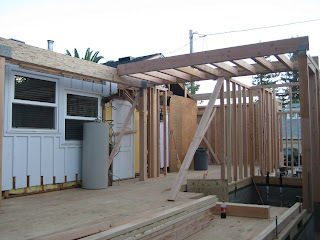 The half-wall on the right surrounds the lower-level mud room. Looking to the left (above our kitchen) is the main part of the loft. This will be surrounded by a half-wall. 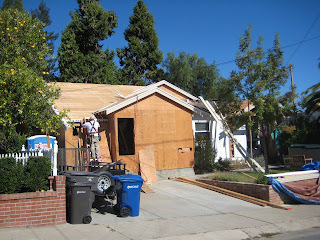 Hopefully we will get the roof on before any further storms hit the bay area! The weather outside is frightful.. I woke up this morning to this sort of view outside the window! They are not expecting the snow to stick, but it will remain below freezing all day. Apparently the usual 'first snow' day is November 17th. I knew it would be colder than Californina, and I did bring warm clothes, but I have been caught rather unawares by the snow! As a girl I read all the Little House books, and endlessly played 'little house' with my friends Clare and Laura. Laura always got to be Laura Ingalls because she had the right name. (No one wanted to be Nellie Olsen). I have copies of all the books and re-read them every now and again. I've read the first few books (before they get too 'girly') with the boys, which they enjoyed - I was surprised - they liked the accounts of making bullets, travelling in the wagon, and the stories about hunting! I'm in Rochester Minnesota again for business. I left San Jose bright and early at 6:30 so ended up with an afternoon at leisure so I decided to make a trip to Pepin, Wisconsin, to Laura's birthplace. The drive from Minneapolis to Pepin was gorgeous: I took the Great River Road, along the Mississippi until I got to Pepin. Lake Pepin, which the Ingalls family crossed while it was frozen, is part of the Mississippi River, and again, was just beautiful in the crisp autumn day. Pepin itself is a very small town. It boasts a Laura Ingalls Wilder Museum, but it didn't really have anything of Laura's: just some contemporary stuff. The Little House itself is no longer there, but a replica is on the site. The little house is indeed tiny, and still seemed isolated, although it sits on one of the main roads out of Pepin. There are no woods any more, the area is really agricultural now, but it was peaceful and pretty, and I was glad to spend my afternoon in Wisconsin. Tonight there is snow forecast in Minnesota - I'm glad I bought my coat, but fear I didn't bring enough knitwear - what an opportunity missed! 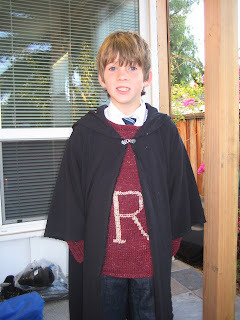 Along with the progress on the house, there has also been progress on the Weasley sweaters. 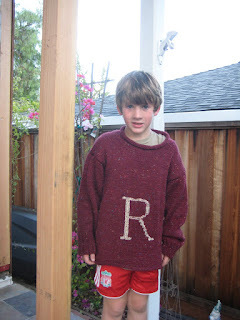 This is Adam's Ron sweater, also knitted in Webs Williamstown yarn in the Merlot colour. 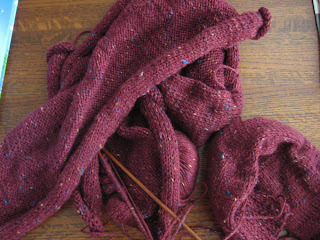 I've nearly finished the knitting on both sweaters, but need to embroider the initials and sew the sweaters up. 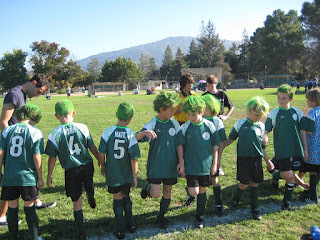 Both boys opted to have character initials rather than their own. I need to get a wiggle on with the finishing as the scout halloween party is on the 20th so I don't have too long! 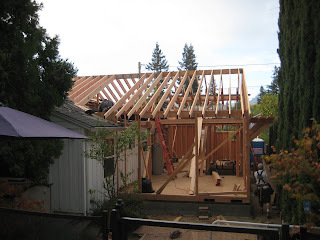 This week the roof framing has gone up. It's fabulous to see the house taking shape, and the layout of the mezzanine/loft looks great. Hopefully the actual roof will go on next week, but it sounds like not soon enough...roofing scheduled for Thursday, rain arriving Tuesday...please keep your fingers crossed for us. By Monday night the new sub-floor and gone down. 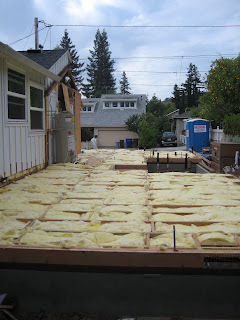 Once the floor was down the framing started. Photo below shows the framing for the windows at the front and the large beam in the foreground is the main support for the roof at the back. This is the height of our rear wall and will have large windows and french doors. 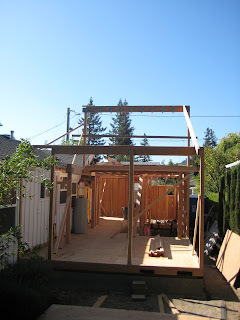 On Thursday the framing for the loft was in place. You can see the new loft gallery in front of the kitchen door. Oddly enough the water heater is right back where it was positioned when we bought the house - bang in front of the door. 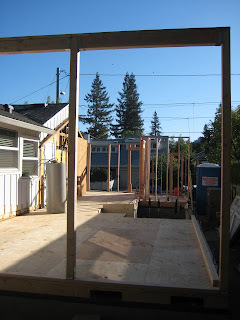 You can also see the lower level of the new mud room/back door in this photo. 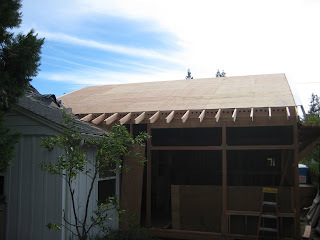 On Friday the roof started to go up. The maximum height of the new build is 1' higher than our existing roof line, but the main roof line will also be raised to match the height. It's really exciting to see the house actually taking shape. However the fun is about to start - I spent the entire weekend clearing everything out of the kitchen because next week they need to open the kitchen roof to tie the new roof the the existing joists. Sadly I mised Lambtown, but Lambtown will be there next year (I hope) when I will have plenty of new storage for additional fiber purchases!